← Diving Knives – Are They Necessary? 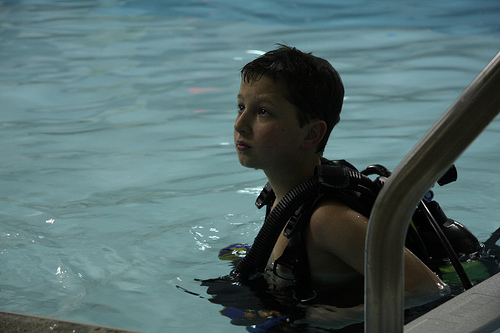 Is it Safe for Kids to Scuba Dive? When it comes to the question of whether or not children should be allowed to scuba dive, there are a lot of arguments for both sides, but the main focus should be the safety of the child. Obviously diving is a relatively dangerous activity for anyone, but does it pose extra risks for children? 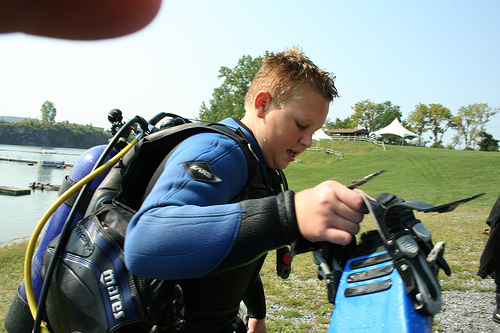 PADI (the Professional Association of Dive Instructors) allows children to become Junior Open Water Divers at the age of 10, and while that may be an appropriate age for some children, it’s imperative that the individuality of each child be considered rather than using that age limit as a set standard. Through no fault of their own, there may be physical developments taking place within children that would make diving potentially hazardous. Research suggests that the passageway inside of a baby’s lungs that allows blood to bypass the lungs while they are in the womb may not be fully closed by the time a child is 10. This condition is called Patent Foramen Ovale (PFO) and while the research has not yet provided concrete proof, this circumstance could increase the risks of decompression illness. We all have tubes in our ears called Eustachian tubes that divers must add air to, to equalize pressure as they go underwater. This is a simple process for adults, but may actually be physically impossible for children since these tubes develop at different rates. If this is the case, the child could end up suffering serious pain or even ruptured ear drums. Obviously, we cannot conduct studies on children to find out what the potential negative results of diving could be on a child; a little thing called ethics prevents that. That’s why it is best to be as cautious as possible and not take any unnecessary risks. Children cannot always tell you exactly what they are feeling and that may end up in a potentially serious problem being overlooked until it’s too late. Keep in mind that pregnant women are discouraged from diving because of the unknown effects of diving on an unborn child. Pregnancy is temporary, and so is childhood. Perhaps if pregnant women are advised to wait, the same should go for children. Diving requires a significant amount of reasoning, focus, and being able to act quickly and rationally; not things children are typically well-known for. The psychological stress involved in diving may be too much for a young child to handle, and the effects of that stress could potentially be serious. 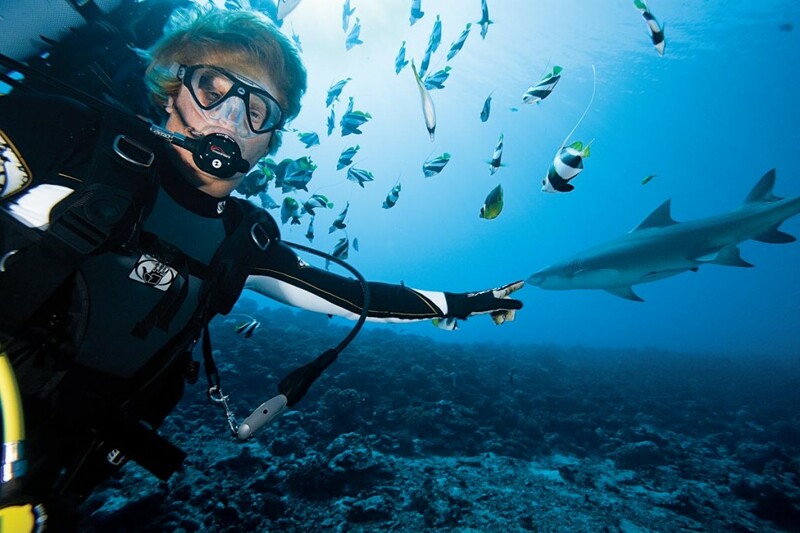 As a diver, you are not only responsible for yourself, but for those that you are diving with. A child would need to have the capability to think and act quickly in case of an emergency, know not to panic no matter what the situation, and be able to put fear completely aside; isn’t that a lot to ask? The closer you look at it, a child on a dive may just become more of a liability than anything else. There is a lot expected of divers even in the beginning preparation stages before they have even stepped into the water. Some children may be able to handle all the pressure and that’s wonderful; just keep in mind that every child is extremely different from another so it is not fair to expect anything different. The most crucial part of deciding whether to take a child on a diving trip is whether or not they are comfortable. Every single aspect of diving; the good, the bad, and the dangerous, should be thoroughly explained and then the child should be allowed to express his or her own feelings. Obviously children do not always understand the incredible risks or their own limitations and that is where you as a parent must make the final judgment call. While you cannot prevent accidents that happen while diving, you can keep them from happening unnecessarily by making the choice that is best for you, your child, and knowing whether or not they are ready. If you decide that the time is not now, there is always plenty of time to plan for a vacation with the whole family when everyone is completely prepared and you won’t have to spend your whole trip worrying. If your kids are old enough to scuba dive why not head over to Cyprus? Kato Paphos is a great location to visit or why not rent one of the many Protaras villas? The diving is awesome during the summer and you are all sure to have a great time! This entry was posted in Scuba Diving, Water Sports and tagged Kids, safety, Scuba Diving. Bookmark the permalink.